Ben thought about the strange course of events that had led him to this point in his life. He had considered being a lawyer but had ended up becoming a doctor, and now he was also a politician and member of the Continental Congress. Ben had never thought of working with the army. But for now, that was what he was doing. He wondered if he too might be called to die for the new country they were trying to forge. 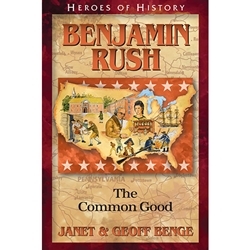 Filled with intelligence and devotion, Benjamin Rush eagerly took up numerous roles as a physician, surgeon general in the army, politician, educator, and writer. A signer of the Declaration of Independence and close friend of John Adams, he made lasting contributions to American society. Born in Pennsylvania, Rush studied medicine with some of the greatest doctors in America and Europe. He was outspoken about improving the conditions and treatment of wounded soldiers and was a lifelong champion of medical care for the poor and freedom for slaves, becoming one of the greatest American physicians and social reformers in history (1746-1813).